oh yes! I like your modifications. especially the indifference look of the Zenuxian. can you please share some download links of your tinkering?! Finally it's looking like a girl. eh... sure I can pack and upload some W.I.P.s and PM you the Url's. and it would seem that there are more Vorticons to tinker with. I made a version of Kylie without the "Keen helmet" and with a slingshot. including an Kylie alternation of the Suburb Shenanigans title screen. I made this Mod, just for today for Ceilick's Episode 8 Mod. Last edited by Zilem on Wed Oct 31, 2018 19:19, edited 3 times in total. Best mod of a mod 10/10! yeah! That's what I call a mod. btw: I noticed you've tweaked the html code quite a bit. to be honest I'm too lazy to compare both codes. can you briefly tell me which part you have tinkered with, please?! if you went trough it you'll know what happened to the helmet. but also why it only available online, for a limited time. which originally was meant to be 24 hours. and paths to the files. fixed prelaunch screen, now show "Kylie"
for: The Galaxy is Toast 7-9, The Eight Accumulators and The Terror from Outer Space. and the Netkeen Character pack, By giving Keen & Kylie a Green Neural stunner and also tweak the Alternate Council page. The Green Neural Stunner sprite pack, is pre-made for Keen 4-6 for Both for Modkeen and Keengraphs. with a few sprite tweaks here and there, with optional world sprite and title screen. When i was a Kid and Played Commander Keen, i though the Council page was a Girl. I'm wondering why there is no Kyle version of my Keen 10: Mirror Menace. I'm wondering why there is no Kylie version of my Keen 10: Mirror Menace. 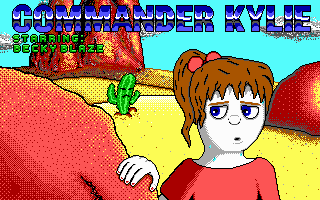 I am currently reworking the Keen and Kylie sprites for Dr. Colossus' Galaxy rename of "Invasion of the Vorticons"
How do I do to launch the Mod of Commander Kylie 9 on DOSBox????? ?